When our friends from France arrived we had to go backpacking into the wilderness, no way around it. 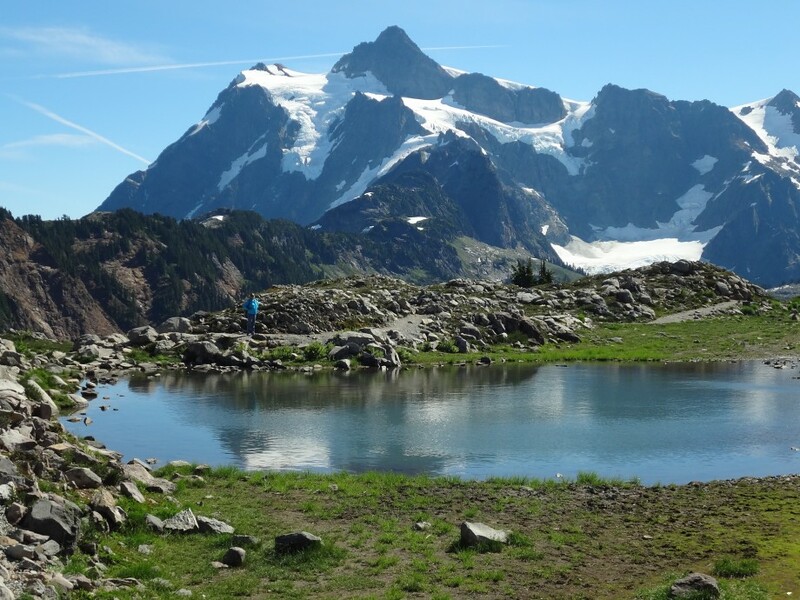 Like many Europeans, they love the vast wildernesses and parks of the U.S. Fine with me since I’m a wilderness nut myself, so I planned two trips into some of the most iconic wilderness areas of Washington State; Robin Lakes and Sahale Glacier. These areas are well known and crowded in summer, but it was September and we’d be hiking during the week so I hoped for more solitude, and we weren’t disappointed. We loaded our packs with food and headed off for the first trip, Tuck and Robin Lakes outside of the old mining town of Roslyn (of television’s Northern Exposure fame) and within the Alpine Lakes Wilderness Area of the Wenatchee National Forest. The fourteen mile round trip hike to Tuck and Robin Lakes starts as an easy stroll through the woods along Hyas Lake, but turns into a strenuous, rocky grind for the last mile into Tuck Lake (so named because it is tucked into a rocky basin). We had the entire basin to ourselves – except for the goats. As we pitched our tents a dozen mountain goats boldly entered our camp unconcerned about our invasion of their area. Turns out they’d be constant companions for the next few days (keep your boots in the tent, they’ll chew on them). The next day we left our camp at Tuck Lake and hiked up the steep and strenuous trail to Robin Lakes. This place is a magnificent, zen-like garden of wind-swept trees and glacier-scoured rock with two crystal clear lakes in the middle of it all. There was one other couple camped among the rocks, otherwise it was deserted. We spent the whole afternoon climbing around the high points, napping on the rocks, wading in the cold water and finally we descended back to camp at Tuck Lake an hour or two before nightfall. As night fell we watched the Milky Way spread out above us and glacier covered Mt. Daniel glowing in the moonlight. Roaming mountain goats woke us during the night, but otherwise we slept soundly. Next day we hiked out, feasting on a bumper crop of mountain huckleberries as we went, and drove home to prepare for the next trek, Cascade Pass and Sahale Glacier. Cascade Pass and Sahale Glacier, another famous and super-popular hike, is within North Cascades National Park with its trailhead reached from Marblemount on highway 20. Just the parking lot at the trailhead is spectacular with avalanches spilling down the face of nearby Mt Johhanesburg as we readied our packs for the hike. Sahale Glacier is about two miles beyond Cascade Pass and less than six miles from the parking lot. The hike up to Cascade Pass is a steady uphill pull through shady forests, but from there to Sahale Glacier we entered an alpine world of open heather-covered rock with marmots basking in the sun and, . . . the trail becomes strenuous. The final pull up to Sahale Glacier was a steep, rocky grind but well worth the effort with views across rank upon rank of glacier-covered peaks (I counted over twenty-five glaciers from our campsite). We camped in the rocky moraine at the foot of Sahale Glacier with ice-melt providing us a steady supply of fresh water. Brice joked that if this place was in the French Alps it would be mobbed, but we shared the entire area with only a couple other small groups dispersed far away across the rocky basin. We spent the next day walking on the glacier, bathing in rocky pools full of icy water, and were generally overwhelmed by the grandeur of the scenery all around us. As night fell we sipped whiskey watching the mountains turn pink in the sunset. Next day we walked out in half the time it took to get there, ate well-earned burgers at a pub along the way home, and turned early, exhausted but happy.